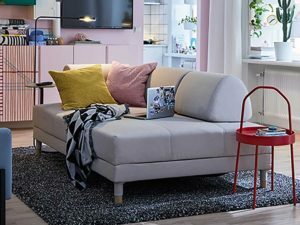 Make the most of your small (or big) space with FLOTTEBO sofa! It will quickly become the center of all of your cherished activities… including sleeping. During the day, the FLOTTEBO makes an ideal lounge area for eating, socialising, knitting, or enjoying your favourite hobbies. The loose cushions can be positioned anywhere on the sofa, whether you want to sit back and relax with a friend, kick up your feet up, or lie back for an afternoon of alone time. The swiveling side table becomes a covenient spot for remote controls, laptops, or an instant bedside stand. During the evening, this versatile and multifunctional sofa bed quickly transforms into a comfy bed. The roomy under bed storage has plenty of space for overnight pillows and sheets. There’s even more storage underneath the bed that keeps your things organized and out-of-sight from unexpected guests. So your knitting supplies, sewing basket, and even your night-time box with eye mask, headphones, and late-night snacks are hidden and within reach. When space is tight, choosing one larger, flexible piece of furniture can be a great option. The FLOTTEBO becomes a hub for all activity… even charging electronic devices.